Bad design hurts your brand. Your brand is what your customers and employees connect with, therefore, hurting your brand hurts your business. We borrowed this idea from “Shadow IT.” According to Gartner, “Shadow IT refers to IT devices, software and services outside the ownership or control of IT organizations.” Shadow design is design created outside of the influence of brand owners. The result is inconsistent and sometimes low quality design across the clients assets. This is a product employees and other stakeholders can easily see. This is a problem faced by large companies, even when they employ hundreds of designers. The design teams focus on the big, high visibility projects, and smaller everyday projects are ignored. Employees must then find other solutions. Many executives believe good branding creates revenue and incorporate that into their strategy. 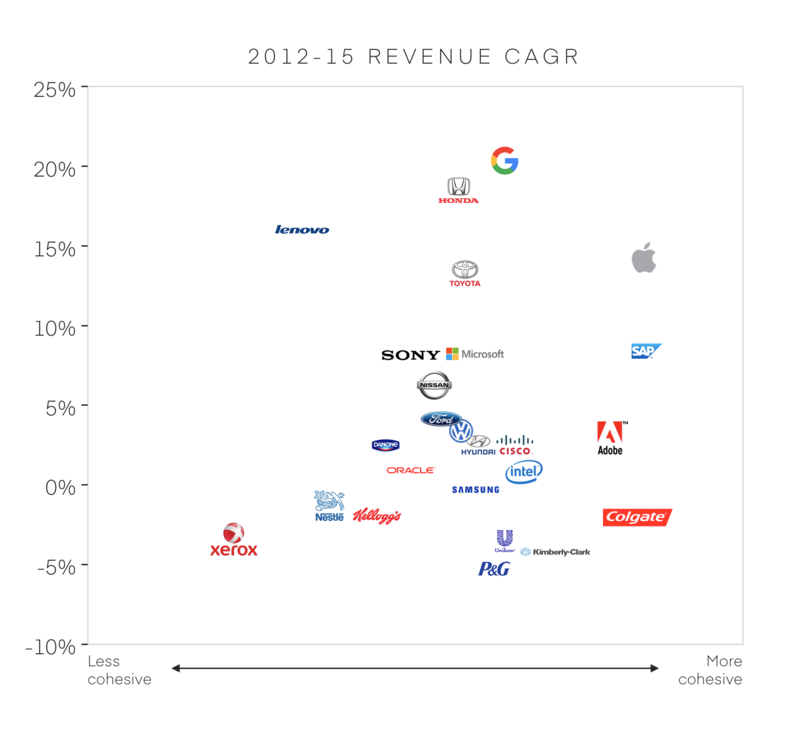 Research from Interbrand shows a strong correlation between the consistency of branding and the revenue a company earns. An inconsistent brand’s earning potential is diminished. When hundreds of design projects need help each month, hiring another designer is not enough. Management overhead grows, the design team becomes a bottleneck, and people stop sending projects, causing the problem to grow. Instead of one standard applied across all design, everyone is doing their own design work, and none of it resembles the brand’s voice. This results in shadow design. Before it even began, the strategy of building brand value is bust. In the S&P 500, average CEO pay is $13.8 million dollars according to this Glassdoor report. And yet, we’ve heard stories of CEOs and executives at these companies staying up late to make design tweaks for a presentation they’re giving the next day, in turn reducing their productivity. All client-facing roles need design. The inability to get good design makes it less likely that they’ll accomplish their goals. If a salesperson is creating pitch decks instead of closing deals, that results in fewer deals and less revenue. Marketing putting out emails which are off-brand or look bad results in fewer conversions, which again means less revenue. Letting teams work on shadow design, instead of growth, is a great way to silently kill ROI. Brand consistency leads to trust, and a lack of consistency removes trust. It’s an equation which has impact on all companies. If a prospect trusts your company less than a competitor, you’ll lose – every time. Look at the recent Equifax hack. In the rush to recover, Equifax created an identity protection website which was not on their branded domain and didn’t have the correct voice or visual design to establish trust. As a result, several phishing sites were set up, and in one very well known example caused serious additional damage to the Equifax brand. Less wide-reaching examples happen every day at companies around the world. Whether it’s a sales presentation in the default Powerpoint template or an infographic filled with clipart, shadow design damages client trust in ways both big and small. Just as hiring another designer in-house will not solve the issue, neither will retaining an expensive agency who is focused on creative work. Existing design solutions are too slow, too hard to use, too expensive, too limited, have no control over spend, and they don’t scale. SketchDeck is based on the idea that, via software, design should be available to everyone. Starting a project takes just minutes, and managers retain discretion and authority over budgets. Democratizing design access in a company eliminates the in-house design bottleneck and shadow design. Thanks for reading. Ready to take more specific steps to fix shadow design for your company? Attend our webinar surveying “The Design Landscape” to find out how!